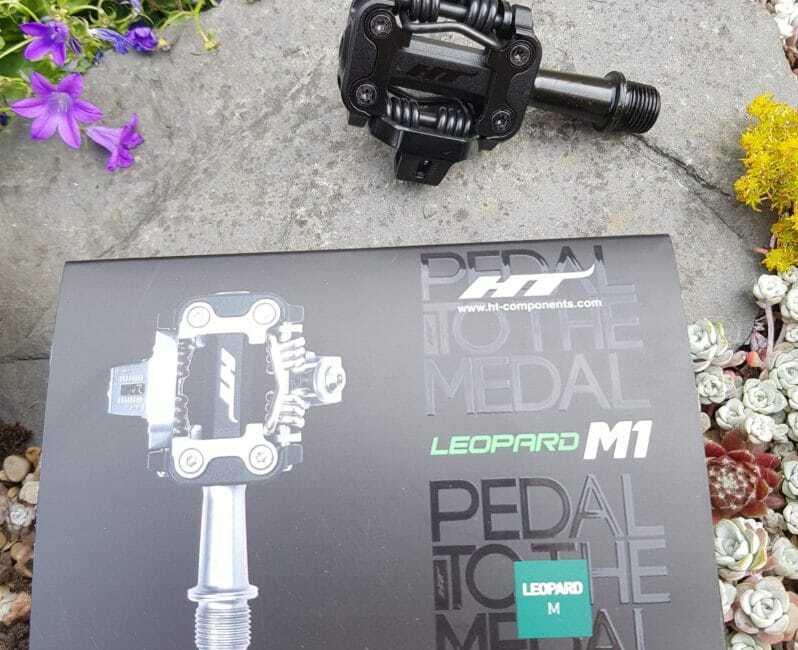 HT Components Leopard M1 Clipless Pedal - ADVNTR. 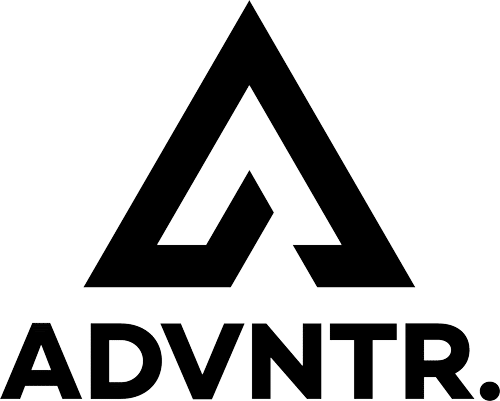 The choice of clipless pedals on the market is huge and for purely practical reasons, gravel riders tend to prefer MTB over road style pedals. 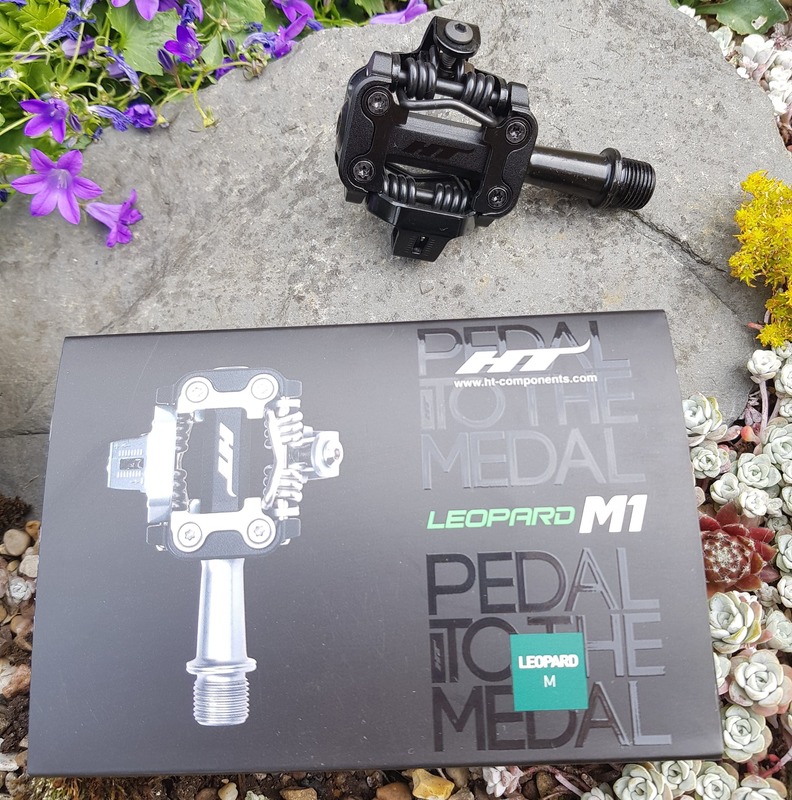 While conventional wisdom suggests that the only sensible option is Shimano, we take a look at the Leopard M1 pedals from HT Components to see how they stack up. HT have adopted the best features from Shimano and Crankbrothers and incorporated them in the Leopard M1. The rear of the cleat interface uses an SPD style pivoting latch, while the front is much like the steel spring clamp found on the Eggbeater. The main benefit is lower weight. We weighed a pair of XTR pedals at 307g and the M1 pedals at 296g. Other benefits apparently include better mud-shifting, but without any mud to test them in recently, we have yet to put this to the test. 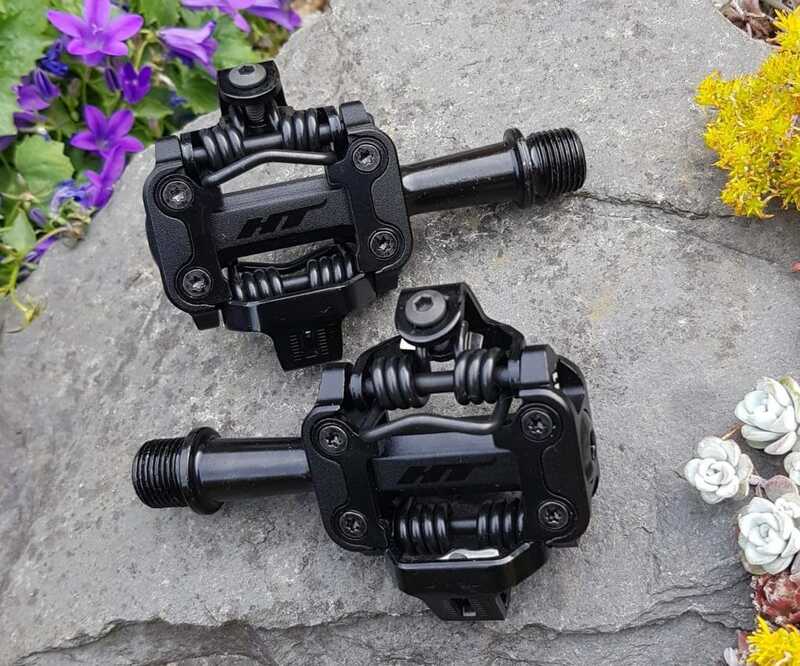 Another similarity to Crankbrothers pedals is their axle design, which uses a small outboard needle bearing and an IGUS bushing on the inboard side. This is all pinched together with a small nut (HT include a service tool so you can open this up) and finished off with a small alloy end cap to provide some protection from the elements. The cleats are are specific to HT’s pedals and are not cross compatible with Shimano SPDs. HT do at least provide two sets of cleats (one with 4° of rotational float, the other with 8°), steel plates with which to protect your precious carbon soles, shims to dial in your fit and as previously mentioned, an 8mm socket to service the pedals. The range of tension adjustment on the M1 pedals goes from nothing right through to extreme. Crank the tension right up and you’ll probably never release your foot from the pedal! It will take you a while to find your ideal setting but it is well worth the time. I found the connection to be rock solid and never unclipped by mistake, even during more exuberant forays in the singletrack. Clipping in is a little more fiddly than with an SPD. Once you are there though, engagement is rewarded with noticeable click! The HT’s have a wider platform than most cross-country pedals. This translates to improved comfort over long distance rides as pressure is spread over a greater area. The HT cleats are thicker than Shimano’s SPD and they stood proud of the grips on my soles. If you do a lot of walking, the cleats will probably wear quicker than those from the Big S.
Worryingly, the spindles began to develop play after less than 800 miles of dry riding. We have become used to Shimano pedals lasting 1,000s of miles without any issues, so this is a little disconcerting. Tightening the locknut improved things but there is still a discernible wobble. As the mileage tots up, we suspect the bushing will develop further play and require additional re-tensioning. HT Components Leopard M1 pedals – 800+ miles and still looking fairly fresh! Shimano are very much the ‘fit and forget’ pedal and it would take an incredible product to truly compete with it. HT Components are on the right track still have a way to go. 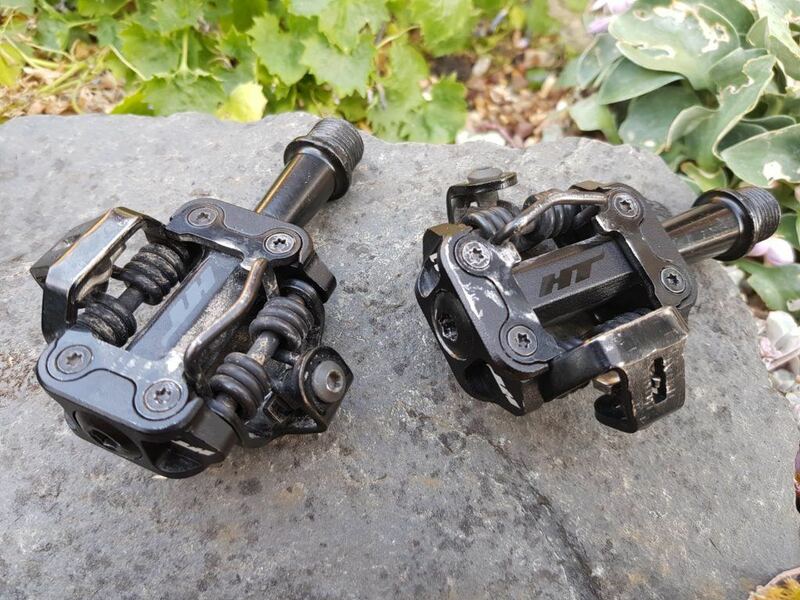 If you can tolerate (or enjoy) regular tinkering in the shed to keep on top of the wobbly spindles, the HT pedals are a great way to loose some weight from your bike. Stump up the extra cash for the 252g titanium version if you want extra racy bling but be prepared for your wallet to take a hit. At £179.99 they aren’t cheap!